Hello! 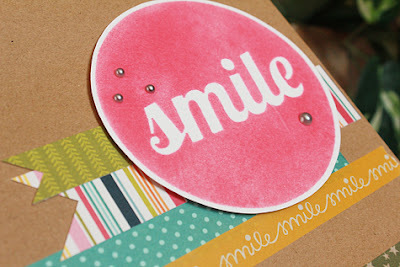 Today I am reviewing the double-sided adhesive from Silhouette. I have used my Silhouette Cameo a lot for scrappy projects but have mainly used it to cut paper so I was excited to get to try this new double-sided adhesive. It sounded easy enough so I gave it a go. 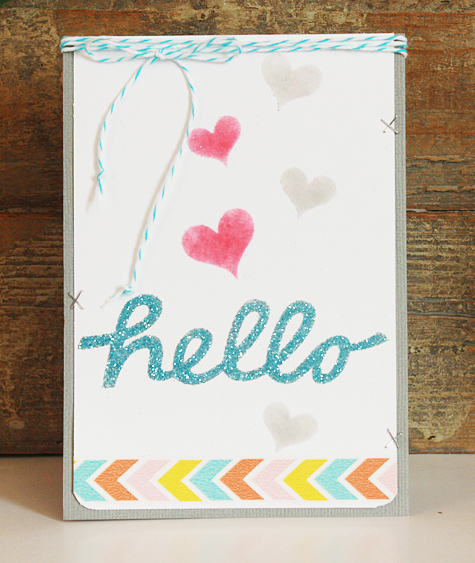 The kit comes with six 8 1/2 x 11 sheets of the double-sided adhesive, a sampling of 3 colors of glitter (gold, clear, blue) and 3 colors of flocking powder (green, pink, gray), an instruction booklet, a spatula and brush, a download card with 10 free shapes you can use. - The starter kit comes with everything you need to learn the basics. 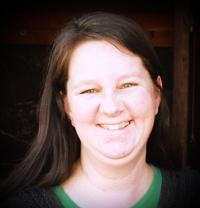 -I'd wanted to try flocking before and this was the perfect chance to learn! -The glitter was messier than I anticipated; the brush included in the kit is to help clear off excess glitter/powder but tended to just spread it around more. For this I used flocking powder and glitter. 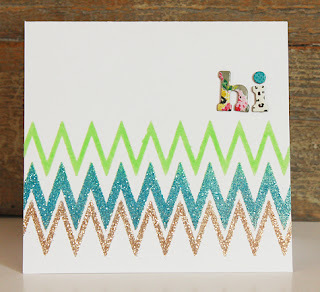 The zigzag cut file is one that is included on the download card that you receive with the Starter kit. Instead of doing all of the stripes the same color as shown in the instruction booklet I decided to do each separately and try out more of the colors included in the kit. This was easy to do and the glitter and powder applied to the top and bottom stripes didn't mess up the middle on that I'd done first. 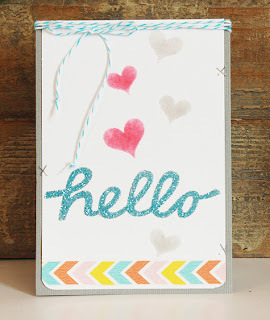 I really liked the blue glitter so I used it again on this card along with the pink and gray flocking powder. You can use the cut files from the card or any that you own that are suitable for cutting with the double sided adhesive sheets. I found that large shapes and those without intricate details cut with no problem using the cut settings from the instruction booklet. Supplies: Pebbles Inc. Sunny Side collection, Queen & Company pearls, Pick Your Plum Twine, KI Memories tape. The "smile" cut file is also included on the download card. 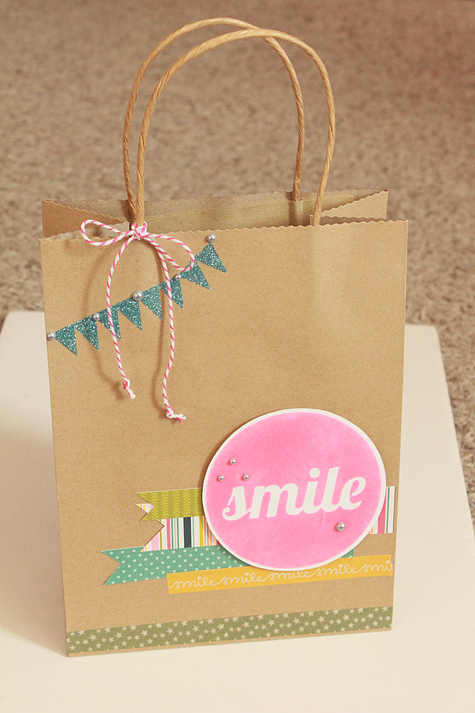 I used the pink flocking powder which I found to be easier and less messy to use than the glitter. It was easy to apply by taking a bit in my fingertips, applying it to the shape and then spreading it around. 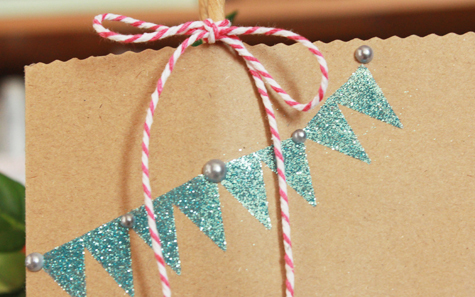 To make the banner on the gift bag I used some leftover bits from the zigzags on the first card. I didn't get even coverage with the flocking powder as you can see since it is darker in some spots than others but I wasn't overly concerned with that. I am sure that with more practice and perhaps more time and patience that will look better. 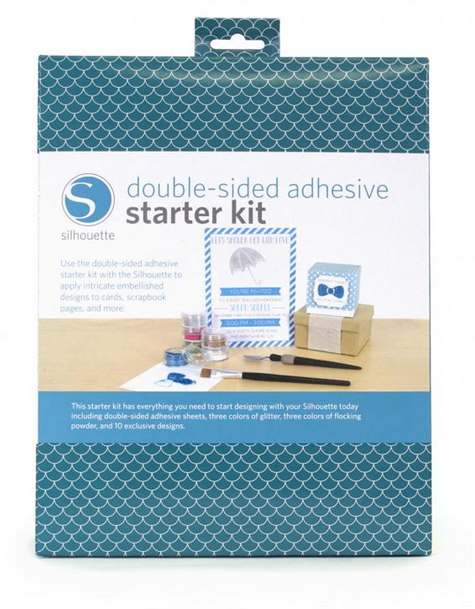 Have you ever tried the Silhouette brand double sided adhesive sheets? What did you make with it? Did you love it and find it easy to use? Share your thoughts with us! I'm not a professional, but I would love to post my experience with this product. I absolutely love it, all of it. It is fun to use and easy to use. When I make cuts, a lot of the interior cuts or what is commonly called weeds or weeding can be saved and used on cards or whatever for just a little glittery bling. It is so fun to try to use every little bit. I do agree with you about the brush not being as helpful as we would like for it to be. If you figure out something, be sure to let us know. Thank you for posting your experience. Have never tried this. I can see where I would probably have problems using glitter too. i havent tried it yet, would love to win it. great job Becky! It seems great. The only down side is the price, I think. have never tried this product, but its definitely on my list of things to buy! especially with an upcoming bridal shower - i can see a lot of uses for this product! thanks for sharing!